By applying five principles into an organization’s culture, leaders can drive results to the next level. I personally crafted and used the following comprehensive leadership model to create an award-winning Fortune 100 Learning Team. Over the course of several decades of working with other leaders and teams, I have documented that those who adopt this model achieve truly winning results! Align around a motivating vision grounded in customer expectations. Defining an inspirational vision is a critical first step in providing the direction and motivation to achieve higher success. This vision needs to be grounded in “what success looks like” for your company and business—based on customer expectations. As trite as it may sound, if you can’t identify what success means to you, how will you know if you achieve it? Include what satisfaction looks like for your employees, customers, and stockholders. If yours is a publicly held company, review the last year’s annual report; really understand and accept your strengths and especially your opportunities. Your vision should be a motivating statement—one that’s tied to stakeholders, and that’s a stretch for the organization. Everyone on the team and all those you lead should be able to relate to it…repeat it…and confidently and enthusiastically explain it. The vision statement should be incorporated into your daily language and interaction with others. Define goals and strategies as a road map to success. Once you have a motivating vision crafted, define the key goals and strategies that need to be in place. These become the roadmap to your destination. Then identify the critical actions that must be executed to move you along the right path. Leaders and team members should focus on those that will have the greatest impact on desired results. Have the right players in the right roles. To have the right players in the right roles, you have to start by hiring the right people. Hire only the best and brightest—A players. It’s not only much easier to accomplish your goals when you have strong players, it’s downright impossible to accomplish them with weak players. Recruit, hire, train, and develop team players who have the ability and passion to bring your vision to life. Ensure workload is broken down into manageable chunks, then match the skills of each individual so they can accomplish their best work. 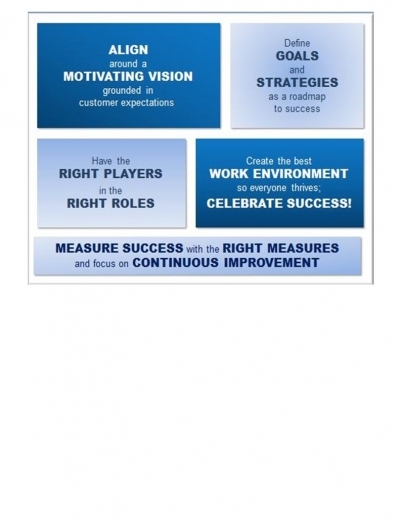 Measure success with the right measures and focus on continuous improvement. The first leadership principle entailed defining a vision for what success looks like. But to know if you’re on track along the way—and if/when you achieve it—you need to measure your progress. Develop “lag” and “lead” goals, along with associated measures that can be efficiently and accurately captured. Lag goals are those interim goals or indicators that will help you hit your lag measures. Create a scoreboard…then use it! Review it regularly and adjust actions/tactics as required to positively affect the score. Establishing regular check-in routines will give you and the team the opportunity to recognize and celebrate progress, which creates energy to keep going forward, or make needed course corrections at the right times. These routines also provide the ideal opportunity for feedback—a tremendous gift when given and received! Your scorecard also becomes the basis for continuous improvement as you set and achieve ever-higher goals that improve the business. By applying the above five principles into an organization’s culture, leaders can drive results to the next level! Diana Thomas, MBA, is an executive thought leader, advisor and coach. As a proven successful executive, Thomas brings decades of experience, expertise, and education to her work with business executives, teams, and Learning leaders to increase their impact, inspire committed followership and engagement, and build strong diverse teams that pull together to achieve winning results. Thomas began her career as a McDonald’s restaurant crew member in 1979, and rose to become vice president of Training, Learning & Development for McDonald’s USA. In this role, she led all aspects of training and development, including the restaurant training curriculum at Hamburger University, McDonald’s global training center of excellence.